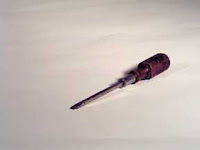 The recent March 2012 additions for the Screwdriver Collection are updated on the website. Referring back to the last blog post (March 25, 2012) there are two versions of the collection to view on the website, one only contains the new March addition and the other option is to view the Screwdriver Collection in its entirety. For the element of public access of the collection, I have added two more social media options which are Pinterest and StumbleUpon. This offers several social media options for the public to keep updated on the recent additions. For now, I have been using Facebook’s “ask a question” feature to incorporate some interaction with the people who follow the collection with this social media. The questions have revolved mostly around the Coupon Collection and estimating the next monthly tally. For the Screwdriver Collection I asked in regards to the clips from the March additions “Which clip did you relate to using the screwdriver in that manner?” This question or poll option fulfills a possibility for the collection to offer some interaction with the participant’s experience in the intangible public domain (the internet).